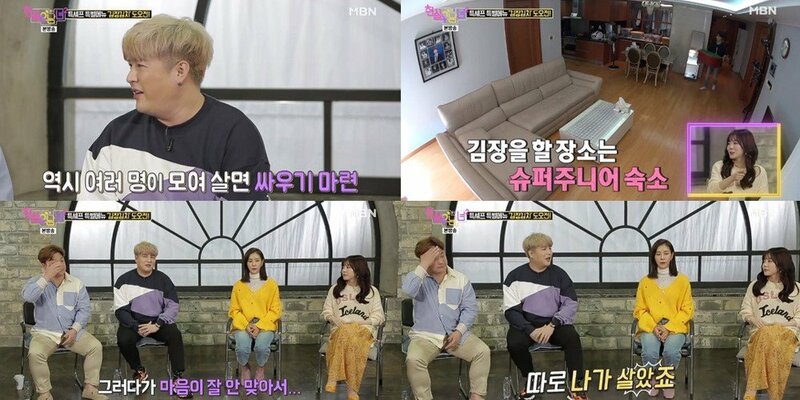 Super Junior's Shindong appeared as a guest on the latest episode of MBN's 'Real Life Men and Women' season 2, airing on Saturday, October 20. On this episode, Shindong attempted to make kimchi on his own, and chose to do so at Super Junior's dorm. However, Shindong revealed that he doesn't actually live at the dorm, and said, "Currently, it's Ryeowook and Kyuhyun living at the dorm." The idol added, "I have a lot of memories in that dorm. The members would all live together and decide on the house rules, and we would also switch rooms periodically to not become uncomfortable with one another." Then why did Shindong move out of the dorm? "We just kept having conflicts. It can't be helped that when many people live together, you get involved in arguments," Shindong confessed. I totally believe that. Very honest. He didn't want to share the food.